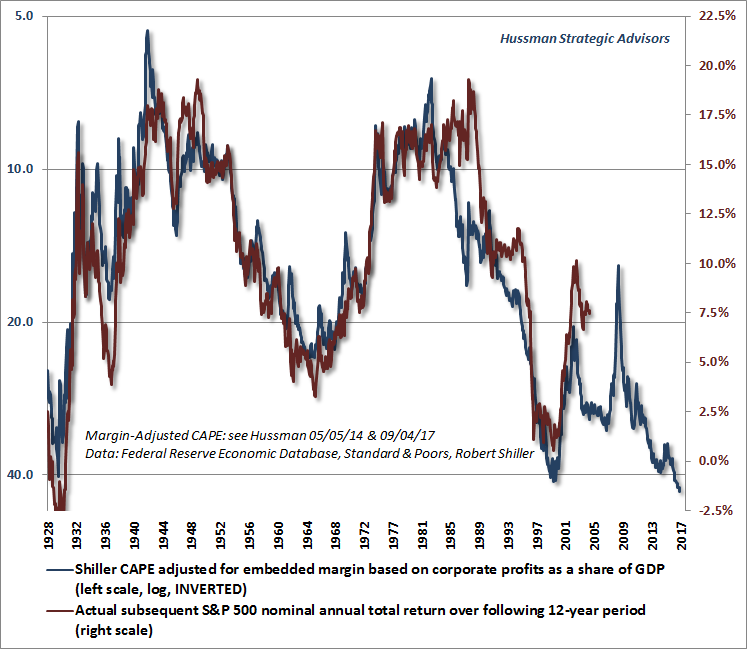 The chart below shows Dr. Hussman’s variant of Robert Shiller’s cyclically-adjusted P/E (CAPE). Shiller’s CAPE is based on the ratio of the S&P 500 Index to the 10-year average of inflation-adjusted earnings. 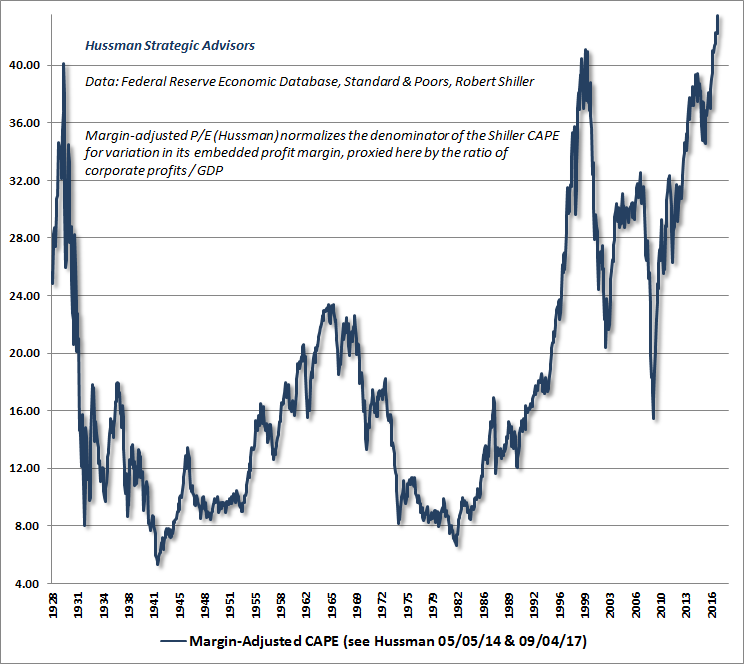 The Margin-Adjusted CAPE is based on the observation that, like many earnings-based market valuation measures, the CAPE can be substantially improved, as measured by its correlation with actual subsequent market returns, by adjusting the multiple for its embedded profit margin. This adjustment corrects for the tendency for valuation multiples to appear misleadingly low when corporate earnings are at cyclically-elevated levels, and to appear misleadingly high when corporate earnings are at cyclically-depressed levels. It is notable that even though Shiller’s CAPE uses a 10-year average of earnings, adjusting the CAPE based on its embedded profit margin markedly improves the relationship between the resulting valuation measure and actual subsequent market returns across history. The CAPE (calculated here as the ratio of the S&P 500 to the 10-year smoothing of inflation-adjusted earnings) is multiplied at each point in time by a factor equal to the 10-year smoothing of corporate after-tax profits to GDP, divided by the historical norm of 5.4%. The resulting measure is similar to the S&P 500 price/revenue multiple, the ratio of market capitalization to corporate gross value-added, and other measures that share a correlation near 90% or higher with actual subsequent 10-12 year S&P 500 total returns in market cycles across history. Click the chart to enlarge. The chart below shows the relationship between the margin-adjusted CAPE above and actual subsequent 12-year S&P 500 total returns (we use a 12-year horizon because that’s the point where the autocorrelation profile of valuations (the correlation between valuations at a given point in time and valuations at previous points in time) typically reaches zero. The blue line shows the margin-adjusted CAPE on an inverted log scale, so lower levels on the blue line represent more extreme levels of overvaluation, and higher levels on the blue line show more extreme levels of undervaluation. The red line shows actual subsequent 12-year market returns (and of course, ends 12-years ago). Click the chart to enlarge. While corporate earnings are necessary to generate deliverable cash to shareholders, comparing prices to earnings is actually quite a poor way to estimate future investment returns. The reason is simple - most of the variation in earnings, particularly at the index level, is uninformative. 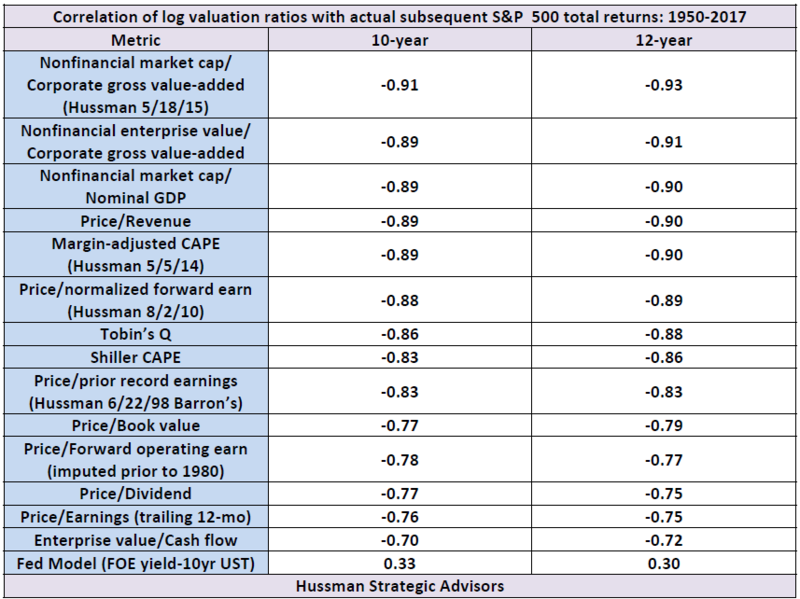 Not surprisingly, the valuation measures having the strongest correlation with actual subsequent investment returns across history are smoother, and serve as better “sufficient statistics” for the relevant long-term cash flows. The table below compares the historical reliability of a variety of alternative valuation measures in data from 1950-2017. Click the table to enlarge. There are two central considerations in investing that, when used in combination, have been the source of virtually every major success we have enjoyed in prior market cycles, and when inadvertently missed or underappreciated, have been the source of virtually every significant disappointment. The first is what we often call the Iron Law of Valuation: every security is a claim on an expected stream of future cash flows, and given that expected stream of future cash flows, the current price of the security moves opposite to the expected future return on that security. The higher the price an investor pays for that expected stream of cash flows today, the lower the return that an investor should expect over the long-term. Particularly at market peaks, investors seem to believe that regardless of the extent of the preceding advance, future returns remain entirely unaffected. The repeated eagerness of investors to extrapolate returns and ignore the Iron Law of Valuation has been the source of the deepest market losses in history. The second consideration, however, is equally important over any horizon other than the long-term. We call it the Iron Law of Speculation: The near-term outcome of speculative, overvalued markets is dependent on investor preferences toward risk-seeking or risk-aversion, and those preferences can be largely inferred from the uniformity or divergence of market action across a wide range of individual stocks, industries, sectors, and security-types, including debt securities of varying creditworthiness. When investors are inclined to speculate, they tend to be indiscriminate about it. In the long-term, investment outcomes are chiefly defined by valuations, but over the shorter-term, the difference between an overvalued market that becomes more overvalued, and an overvalued market that crashes, has little to do with the level of valuation and everything to do with investor attitudes toward risk. If you have the long-term available to you, there’s nothing particularly wrong with being a value investor. Over the long-term, disciplined, historically-informed, value-conscious analysis pays off. But over shorter horizons, a singular focus on valuation can be extremely uncomfortable. Over shorter segments of the market cycle, valuations can depart dramatically from historical norms, and even objective extremes in valuations may not result in "mean-reversion" for an extended period of time. Still, these deviations are highly informative about longer-term market returns, particularly on a 10-12 year horizon. Conversely, the strongest market return/risk profiles we identify are associated with markets that have experienced a material retreat in valuation, coupled with an early improvement in our measures of market action. This combination emerges in every market cycle, and can provide opportunities to substantially increase exposure to the financial markets after periods of extreme speculation are resolved by market losses and improved valuation. One more Iron Law will help to put market conditions into perspective. It’s what we call the Iron Law of Equilibrium: once a security is issued, it must be held by someone at every point in time, until that security is retired. For example, every dollar of monetary base created by the Federal Reserve has to be held by someone, in the form of base money, until it is retired by the Fed. Buyers never put those dollars “into” the stock market without sellers immediately taking those dollars right back out. So the pile of base money “on the sidelines” never comes “off the sidelines” because it can’t magically transform into something else; it just changes hands. Likewise, the Iron Law of Equilibrium says that there are never “more buyers than sellers” or “more sellers than buyers.” Every share of stock that is sold by a seller goes into the hands of some buyer. Prices aren’t driven up or down by “money flow” or a surplus of buying over selling. Prices are driven up or down depending only on who is more eager, the buyers or the sellers. If one recognizes that every share of stock is a claim on a future stream of cash flows that will be delivered into the hands of the investor over a very long period of time, investors in the fourth-quarter of 2017 should be very concerned about the valuations that investors are paying for those claims. In their exuberance about low interest rates “justifying” elevated market valuations, investors have neither quantified the “justified” effect of lower rates, nor appropriately considered the long-term dynamics of the cash flows they are purchasing. The proposition that lower interest rates justify higher valuations relies on the assumption that the stream of future cash flows is held constant. Provided that one holds the growth rate of future cash flows constant, the impact of a reduction of interest rates (and prospective returns on competing assets like stocks) is straightforward to calculate. If interest rates are expected to be held, say, 2% below average for a period of say, 10 years, a one-for-one response for other assets would be to raise their valuations by about 20% (2% x 10 years) above their respective historical norms. For example, a $100 cash flow, deliverable in 20 years, would be priced at $21.45 in order to achieve an 8% return over that period ($100/(1.08)^20). If one reduces the prospective return to 6% for the first 10 years, and 8% thereafter, the appropriate price is ($100/(1.06^10)(1.08^10) =) $25.86, which is not surprisingly about 20% higher. So provided that investors actually expect future economic growth to match historical rates of growth, investors expecting interest rates to remain say, 2-3% below historical norms even another decade would still only be “justified” in bidding stock valuations 20-30% above their historical norms. On the most reliable measures we identify, valuations in the third-quarter of 2017 actually approach 150% to 170% above those norms. Moreover, based on demographic projections by the U.S. Department of Labor, even if the unemployment rate does not rise from the September 2017 level of 4.2%, the contribution of employment growth to GDP will average just 0.2% annually in the years ahead. The fact is that since 2010, nearly half of real U.S. GDP growth has been driven by a declining unemployment rate. This has largely prevented investors from recognizing that the two drivers of long-term growth, labor force growth and productivity growth, have slowed to just 0.3% and 0.6% annually, respectively. This puts the baseline for GDP growth in the coming years at less than 1% annually, and even a substantial improvement in productivity growth would leave average annual U.S. real GDP growth below 2%. Put simply, the underlying drivers of real GDP have been progressively weakening in recent decades, reflecting a combination of demographic factors and slowing productivity growth. Indeed, excluding the impact of changes in the unemployment rate (which are unlikely to help future growth, given an unemployment rate that has declined to just 4.2%), the structural drivers of U.S. GDP growth have never been weaker. It is essential to recognize that if interest rates are lower because likely future growth in deliverable cash flows is also lower, then no valuation premium is justified at all. As of October 2017, on the measures we find most tightly correlated with actual subsequent market returns across history, the S&P 500 is now between 150% and 170% above valuation norms that have been approached or breached over the completion of every market cycle in history, including the most recent one. Allowing for a lesser retreat ending about 25% above those norms, one would still expect the S&P 500 Index to lose between 50-63% as this speculative episode unwinds. Even at that point, future prospective equity market returns are likely to be lower than investors have historically enjoyed. Technical Note: We are not great fans of infinite growth models, but the following result is very general. Consider the Gordon model P = D/(r-g), where P is “fair” price, D is the dividend (or other distribution of cash that the stock is expected to deliver over the coming year), g is the growth rate of future cash flows into the infinite future, and r is the rate at which those cash flows are discounted to present value (which is also the long-term rate of return that investors can expect if they pay price P and future cash flows are delivered as expected). Provided that the long-term trajectory of future cash flows is held constant, reducing r alone will raise the price, and therefore the valuation multiple P/D. Accordingly, the investor's expected future long-term return falls to the lower r that is now embedded in the price. That's the "lower interest rates justify higher valuations" argument. The lower r does still mean that the investment should be expected to have lower future returns as well. In this case, that is accomplished via the higher valuation multiple. Now, simultaneously reduce both the discount rate r and the growth rate g to the same extent. What happens to the fair value P or the fair valuation multiple P/D? Nothing. Yet even though valuations haven't changed, the lower r does still mean that investors should expect lower future returns as well. In this case, the reduction in future returns is accomplished via the lower growth rate. Paying obscenely higher valuation multiples on the notion that they are "justified" by the lower r actually causes an additional, wholly unjustified collapse in future investment returns, which is exactly what investors appear to be inadvertently doing in late-2017. U.S. real GDP growth is driven by the sum of two factors: growth in employment (the number of workers) and growth in productivity (output per worker). Based on demographic factors such as population growth and labor participation rates across an aging workforce, combined with an unemployment rate of just 4.2% as of September 2017, projections by the U.S. Bureau of Labor Statistics imply that the employment contribution to GDP growth is likely to average just 0.2% annually over the coming 7 years; a small fraction of the post-war growth rate. On the productivity side, as of 2017, U.S. productivity has persistently slowed from a post-war average of just over 2% annually, to just 1% over the past decade and only 0.6% over the most recent 5-year period. That leaves the baseline expectation for real GDP growth, even in the absence of a U.S. recession, at just 0.8% annually. The following charts illustrate these trends. 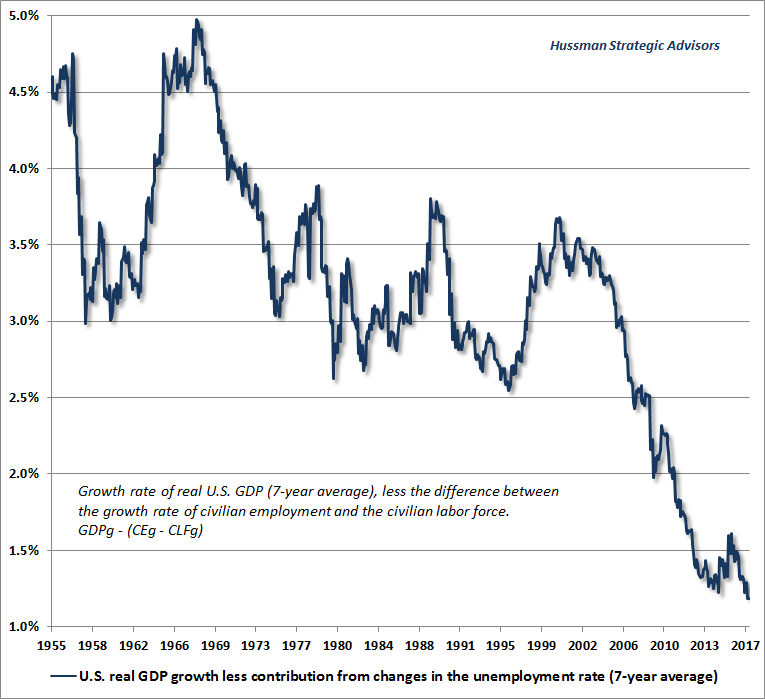 Note the persistent slowing in the contribution to real GDP from labor force growth in recent decades. On the productivity front, booms in U.S. productivity are typically paced by growth in capital expenditures and other domestic investment. As a historical regularity related to the savings-investment balance, booms in domestic investment invariably emerge from an initial position of balance or surplus in the U.S. trade balance. Given the deep deficit at present, such a boom is not likely forthcoming. The slowing of U.S. labor force growth, coupled with a gradual and persistent slowing in productivity growth, has combined produce a persistent slowing in the rate of potential and actual U.S. real GDP growth.